Giving small and mid-size manufacturers and distributors visibility. The concept of Customer Relationship Management is enjoying renewed emphasis as a way to add to revenues and gain market share and is also gaining in sophistication. Companies are seeing the advantage of drilling down into their own customer databases to ascertain buying patterns, product preferences, the potential for add on sales, and more. Fill out the form to the right for instant download! 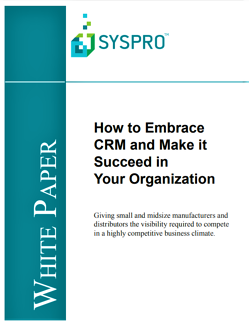 Learn more about CRM for SYSPRO.